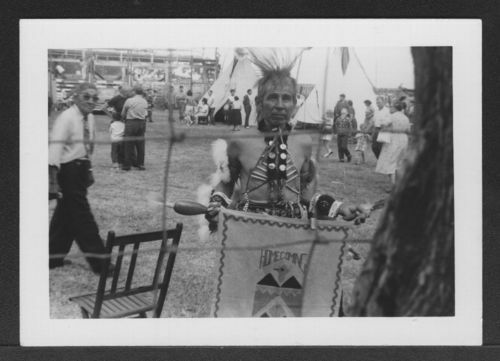 This photograph, taken in 1961, depicts a Prairie Band Pottawatomi man at an Indian dance in Mayetta, Kansas. The man holds up a banner, which describes how he won an award from Haskell University as the "Outstanding Indian Dancer." This source serves to demonstrate how emigrant Indian tribes in Kansas strived to keep their traditions and customs alive. It could be grouped with other sources that demonstrate the native traditions of tribes in Kansas during the twentieth and twenty-first centuries.